Guest Post from Margaret Wolfson, CEO, River + Wolf. Since the beginning of time, we’ve used storytelling to convey our experiences and express our individuality. While it’s recently suffered the trivialization most buzzwords do, the fact remains that in today’s world of choice overload, brand storytelling is more important than ever. Storytelling versus effective storytelling is the difference between a passive whisper that falls on deaf ears and a declarative voice that commands attention and admiration. In the spirit of the holidays, let’s take a look at two recent campaigns from Apple and Amazon to pinpoint five keys that these companies use to win over customers around the globe. Amazon also recently ran an ad that appears to be a response to the 2016 presidential campaign. While the ad is designed to promote the company’s Amazon Prime membership, its theme takes it beyond boosting product sales. 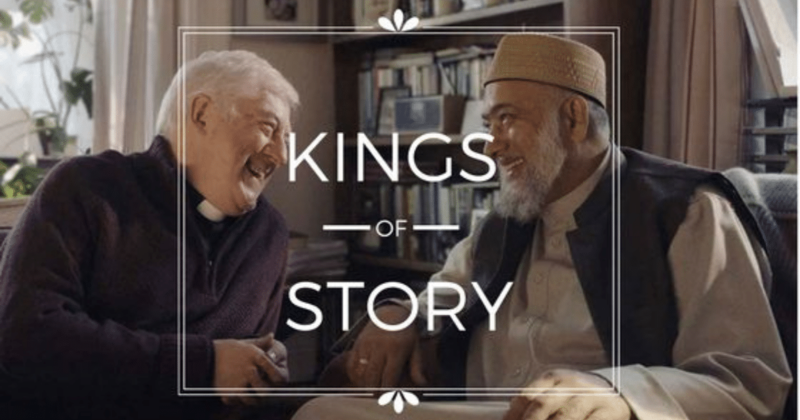 The ad shows a priest and imam having a pleasant conversation over tea. As the imam prepares to leave, both men remark at their sore knees, share a hug, and part ways. Afterward, they both take out their smartphones and buy the other knee braces through Amazon Prime. The ad ends with both men kneeling to pray in their places of worship with the same kneepads. Both striking on a number of levels, what is it that makes these two stories so compelling? While being timely can mean several things, including tying your stories to trends, holidays, or other relevant factors, some of the most successful storytelling campaigns tap into the zeitgeist–the collective conscious–of the moment. Defined as the “defining spirit or mood of a particular period of history”, tapping into the zeitgeist can be extremely powerful. This election season created a distinct split in our country and beyond, pitting individuals against each other on the basis of their differences. What Apple and Amazon have done in these ads is tap into those timely feelings in metaphoric and evocative ways and appealed to the greater good in humanity. Something everyone can get behind. Each of us is distinguishable from the other seven billion people on earth. Think of any brand as a person – imagine what characteristics they’d have if you met them in real life. Would you want to talk with them? What would you talk about? How would you represent yourself in their presence? These are the same questions prospective customers ask when choosing a company to do business with. Your company’s unique characteristics should be consistently pulled through your story. Amazon and Apple not only literally created relatable characters in their campaigns, but in doing so, they’ve also further shaped their brand characters, cementing qualities of acceptance and inclusion. While there’s no doubt that both Cook and Bezos’ teams intended to drive sales with their ads, it’s clear that that wasn’t the only thing on their minds when they went to the drawing board. A good brand is able to convey the human value of what your products and services provide. For example, if you’re a financial services firm, your purpose is not to profit from fees on investments, but to empower your customers to lead more fulfilling lives. Convey that higher purpose whenever and wherever you tell your story. As Pixar veteran, Matthew Luhn, says “People don’t make decisions with the rational parts of their brain. All our big decisions are made with the right side of our brain. In other words, we make choices based on feelings, and then later we justify those feelings with the rational, left side of our brain.” One of the best ways to elicit feelings is empathy. Empathy is about standing in someone else’s shoes, feeling with their heart, seeing with their eyes. Chances are you did this when you created your product and service. And if not, you may want to go back to the drawing board. When you tell your company story — in the media, on television or any form of brand storytelling and writing — illustrate the real problems that you are solving for people. While both of these campaigns ran primarily on television, they have extended their lifespan on YouTube. “Frankie’s Holiday” has been viewed on Apple’s Youtube channel over 7 million times since the commercial first aired on television. Between April 2015 and November 2015, the amount of average daily video views on Facebook doubled from 4 billion video views per day to 8 billion. On top of that, 51.9% of marketing professionals worldwide named video as the type of content with the best ROI. Quite simply, if your content and storytelling strategy doesn’t include video, you’re missing the boat. Next time you want to sell your business to someone, whether they’re a potential customer or an investor, remember that you aren’t selling a product or service, but rather the story behind it. If you can do that, you’ll have a much better chance of standing out from the crowd and ensuring your success.